How much fun can you really have controlling one tenth of an army? Total War: Arena a free-to-play online RTS built around 10 vs 10 battles, in which each player controls three units. It's less of a shambles than 20 players pushing 60 units around a single map ought to be, but it is still quite a shambles, and one mired in a ponderous progression system borrowed from World of Tanks. I love a bit of Total War, but it's impossible to escape the sense that this one should have stayed on the 'mad ideas' whiteboard. Your mission is to cap your enemy's base at the other end of the map. Between each base there are smaller points that you can take to peel back the fog of war. The terrain is rich. Elevation shifts and blocking walls create choke points. Forests hide units, low walls can be garrisoned and racks of wooden stakes deter charges. Before battle you pick a commander to unlock abilities for your troops. Germanicus can order infantry units to lock shields and adopt Testudo formation to ward off ranged fire, while Caeser's upgrades boost allied units' defense and attack damage. Ah, Julius Caesar: one of history's great supports. As your commander slowly levels up you can use Free XP earned in battle, or paid-for Gold, to unlock new commanders and units. You can mix and match your trio to incorporate close combat fighters, long-range fighters with bows or javelins, and artillery. In battle you ideally want to manoeuvre alongside other players so your lone trio of units doesn't get immediately chewed up. Across the course of a 10-15 minute conflict, though, there's little opportunity for communication, particularly when you come into contact with the enemy and need to activate each unit's special abilities to throw javelins, switch formation or make a charge. Map pings help players to spot artillery and incoming forces, but I spent most of my time trying to second guess whether nearby allies wanted to push forward, fall back or, often, just stand there and wait for the enemy to turn up. Battles are short, but even so there is some waiting around, especially if you decide you want to take some ranged units and lock down key roads, or just defend the base. Plus if your units are all wiped out you can't use your commander again until the battle is over. I found myself alt-tabbing out to do something else while my dead commander lay on the battlefield waiting for someone to finally capture the damn winning point. In the open beta the starting commanders for the Barbarian, Roman and Greek factions are available, but it's unsatisfying to have to shift down to a low-level commander. I found myself alt-tabbing out to do something else while my dead commander lay on the battlefield waiting for someone to finally capture the damn winning point. If I wasn't playing the game for this write-up I would have just walked away forever. There are a few things to admire about Arena. It works smoothly on a technical level, which is neat considering how many players there are in a battle. It looks as though the game is built out of an earlier iteration of the Total War battle engine, but the maps in particular look great and it runs well. The UI is good too. Unit outlines help you to clearly pick your warriors out from a massive scrum. Massive icons pop up over enemies you've routed or destroyed to deliver a little 'well done!' dopamine hit. The units feel more responsive than I've come to expect from Total War battles. In Arena you can disengage with relative ease and your troops are quick enough to respond to the sudden appearance of a bunch of new enemy units at a treeline. At this stage in the open beta ranged fire and artillery seem particularly brutal, however. You can do your best to absorb charges and flank enemies in short range engagements, but there's nothing you can do about a catapult in a forest some distance away, except ping it and hope that one of your nearby teammates cares enough to help you out. This frustration aside, Arena has a bigger problem. 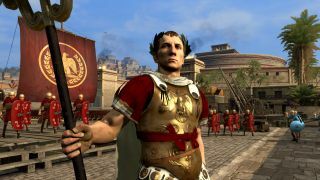 Putting so many players in a Total War battle doesn't add much to the experience, except for plenty of confusion, and to achieve this the design has to strip out almost everything that makes Total War special. Total War is about two things: running an empire on the strategic map level, and being a general on the tactical level. Arena replaces the strategic layer with a sluggish progression system that wants your money, and then slims down your command to a nippy little battalion that can't get much done on its own. Total War could be great in multiplayer, and I hoped that Shogun 2's system would take off more than it did, but though well-made, Arena hasn't nailed that promise yet.